Norma Talmadge (May 26, 1893 – December 24, 1957) was an American actress and film producer of the silent era. A major box office draw for more than a decade, her career reached a peak in the early 1920s, when she ranked among the most popular idols of the American screen. Her most famous film was Smilin’ Through (1922),but she also scored artistic triumphs teamed with director Frank Borzage in Secrets (1924) and The Lady (1925). Her younger sisters Constance Talmadge and Natalie Talmadge were also movie stars. Talmadge married millionaire and film producer Joseph Schenck and they successfully created their own production company. 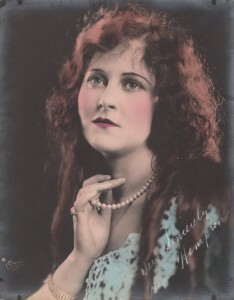 After reaching fame in the film studios on the East Coast, she moved to Hollywood in 1922. A specialist in melodrama, Talmadge was one of the most elegant and glamorous film stars of the roaring twenties. By the end of the silent film period her popularity with audiences had waned. After her two talkies proved disappointing at the box office, she retired a very wealthy woman. 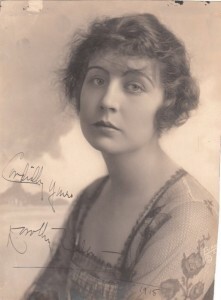 Of all the silent stars whose reputation collapsed with the coming of sound, Norma Talmadge was the most important. She is little remembered, since her films are seldom revived today, yet in her day she was hugely popular and the epitome of stardom. Hope Hampton (Mae Elizabeth Hampton) (19 February 1897 – 23 January 1982) was an American silent motion picture actress, who was noted for her seemingly effortless incarnation of siren and flapper types in silent-picture roles during the 1920s. 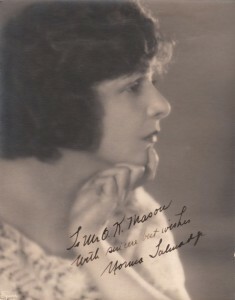 EXTREMELY RARE AUTOGRAPHED PHOTO OF SILENT FILM ERA ACTRESS DOROTHY DALTON. MEASURES 6.5 BY 9 INCH, OVERALL GOOD CONDITION, SLIGHTLY UNEVEN ALONG EDGES FROM BEING CUT DOWN FROM ORIGINAL SIZE. Dorothy Dalton (September 22, 1893 – April 13, 1972) was an American silent film actress and stage personality who worked her way from a stock company to a movie career. Beginning in 1910, Dalton was a player in stock companies in Chicago and Holyoke, Massachusetts. She joined the Keith-Albee-Orpheum Corporation vaudeville circuits. By 1914 she was in Hollywood.